SPECTCOL is a graphical tool implemented in Java. It allows to manipulate and combine spectroscopic and collisional data coming from the databases (BASECOL, CDMS, HITRAN, JPL,…) using VAMDC technology. XSAMS(Xml Schema for Atoms, Molecules and Solids) is the VAMDC data format and SPECTCOL is able to manipulate and provides methods to convert these data into other formats(CSV, RADEX, LTE …). The aim of the client tool SPECTCOL is to associate spectroscopic data provided by spectroscopic databases with collisional data provided by collisional databases using the VAMDC technology. 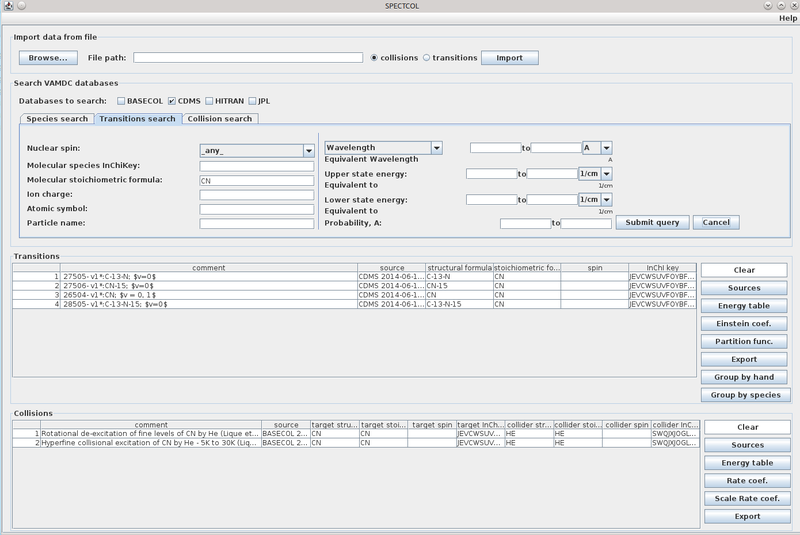 The client tool interrogates the registries to find spectroscopic and collisional information about a molecule. It retrieves different possible sets of data from different databases. The user can associate sets of his own choice in order to create customized combination of spectroscopic and collisional data. BASECOL, and this problem is now solved easily using VAMDC and SPECTCOL. The tutorial or quick start on SPECTCOL allows users to pick up the tool easily. This tutorial describes in a simple way the various stages of functions in Spectcol accompanied each time by specific examples. You can also find in the document a user guide which contains more details. The tutorial is available here.